If you're in search of an easy, semi-homemade-but-still-delicious treat to serve to two for a week or twelve for a day, look no further. I, Krusteaz, and a smattering of chocolate chips are coming to your rescue. While this post and these bars would've been appropriate in the week before Valentine's Day, I dropped the ball and didn't get things in order in time. In my defense, I've been thoroughly distracted by more pressing obligations, like Hay Day (my latest obsession, and as my boyfriend can attest, that's putting it lightly) and catching up on the Great British Baking Show (is everyone in Britain that nice and civil?! )(and how have I never encountered those hilarious hosts?). Excuses aside, this dessert is a wonderful example of one that delivers both in ease and speed of preparation and sweet satisfaction. My hands were busy for about 5 minutes total, and all I had to provide was some butter and a handful of chocolate chips (minus a few that miraculously fell into my mouth). I'll be one of the first to say that chocolate isn't the bee's knees (or the pig's wigs or the cow's brows or the fish's knishes)(Hay Day, ya'll, seriously! ), especially when it gets paired with certain fruits (lemon? ), but I happen to really like it with raspberries. These bars will be ready long before an episode of your favorite show is over, so try to time the baking, rotating, and removal from the oven to coincide with those commercial breaks. Wouldn't want to miss anything pivotal, right? If you're wondering why my bars are so thin, it's because I used an 8x12-inch pan, much larger than the one recommended on the box. I adjusted my baking time accordingly, though, and they turned out just fine--big and wide rather than small and stout. In the words of Mel and Sue, ready, set, BAKE! Heat oven to 350 degrees F. Lightly grease 8x8-inch, 9x9-inch, 7x11-inch, or 8x12-inch baking pan. Stir together melted butter and crust mix with a fork until mixture is crumbly. Spoon 2/3 of crust mixture into pan. Press firmly into bottom of pan. Bake 15 minutes or until edges begin to brown. Spread raspberry filling evenly over hot crust. Sprinkle chocolate chips evenly over the raspberry filling. Crumble remaining crust mixture over everything. Bake 26-28 minutes or until bubbly around edges. Cool completely before cutting. 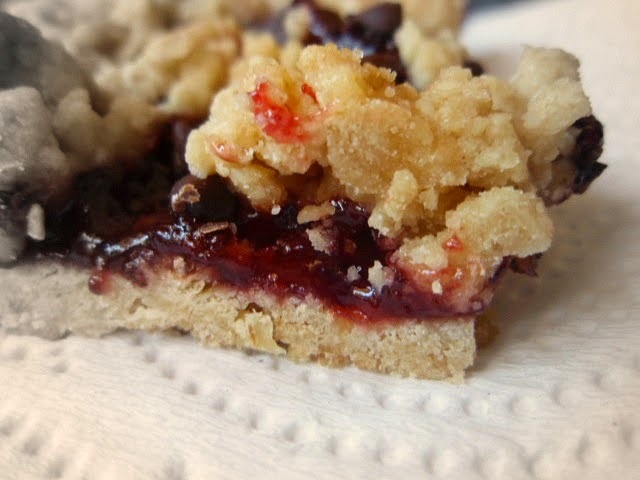 We love crumb bars and this looks very tempting with raspberry filling and chocolate. Looks like a great bar! I remember those days on the farm and manure on the shoes, loved it all but don't miss that. I just started recording GBBS, and hope to watch it soon; my friend said the hosts are a hoot! Looks good. And I loooove the Great British Baking Show too! I bet these bars would be tasty with white chocolate chips too. Love how simple they are! I love the Great British Baking Show. Hubster grumbled that only I could love a TV show about cooking. I told him he is unenlightened. 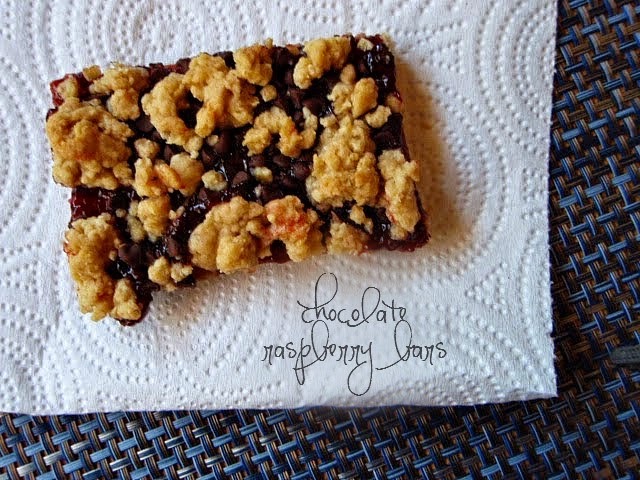 Your bars look good; raspberry and chocolate are a great pairing. Raspberry, Chocolate, Crumbly, I'm in!